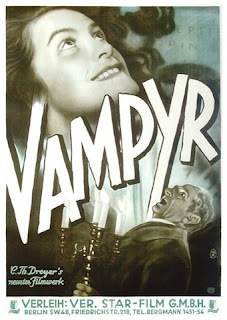 The third of the first three vampire films, after Nosferatu (1922) and Dracula (1931), Carl Th. Dreyer's Vampyr is an important film in the director's career for two reasons - it was the director's first sound film, and it was the first film he made after directing his masterpiece, The Passion of Joan of Arc in 1928. Those who know me know that I consider The Passion of Joan of Arc to be the greatest film of all time, so Dreyer certainly had set the bar very high for himself. It is the only horror film in the director's canon, and is something of an oddity for cinema historians and enthusiasts. Vampyr may be minor Dreyer when compared to his towering works like Joan of Arc and Ordet (The Word), but its nevertheless one of the greatest and most unique vampire films ever made. Despite its status now as one of cinema's supreme achievements, Joan of Arc was a flop upon its initial release, and Dreyer needed a hit. Dreyer saw potential in the horror genre for something more, the chance to create something artistically sound but popularly accessible. Certainly the most impressionistic and dreamlike of those first three horror films, Vampyr is an unusually beautiful piece of gothic horror, filled with haunting images and an eerie sense of disquiet and dread. The film centers around a student of the occult who arrives in a small village outside of Paris to investigate strange goings on, and loses himself in a search for a mysterious vampire who is preying on the locals. Interestingly, the vampire ultimately has little to do with the film, and is rarely seen. What sets it apart from its genre brethren is that the vampire is actually an old crone, not a male preying on innocent women as is often seen. That opens up a thinly veiled lesbian subtext to the film, which while not as prominent as it is in "Carmilla" (the Sheridan le Fanu story on which it is based), still gives the film a jolt of sexuality that stands in stark contrast to other early vampire films. It's almost a silent film, retaining the aesthetics of the silent era (including intertitles) and as such feels like a silent film even though it really isn't. Its unnerving imagery (shadows that move independent of their sources, souls emerging from the body) give the film an air of surrealism, and its quietude, informed by Dreyer's overal distate for sound, make Vampyr an utterly unforgettable experience. There's simply nothing else like it in the genre, and in the hands of a master like Dreyer, it becomes a meditation on death and life after (a longtime fascination for the director) in addition to one of the most beautiful films of its era.